Pertaining to something which decreases in amount, dimension, or forcefulness: Some unsettled conflicts within a family can be considered to be de-escalatory in that some members always talk about what annoys or troubles them. 1. To harm the surface or appearance of something; for example, by drawing or writing on it: The youngman was caught defacing his father's books. 2. To mar or to disfigure: The canyon's spectacular limestone walls have been defaced by the flood waters in the lake that were caused of the severe storm. The teenagers were caught defacing or vandalizing a school building with spray paint. To steal, to misuse, or to embezzle money by someone who is supposed to be taking care of an organization's or other people's funds: The newspaper in Karan's town revealed how the mayor was defalcating expenses from the city's resources to build himself a luxurious home. © ALL rights are reserved. 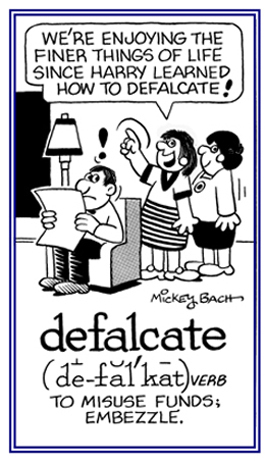 The theft or misuse of money that has been entrusted to a person's care: Defalcation is the misappropriation of money or property by someone who is supposed to be taking care of it; like a trustee, a guardian, a public official, or a corporate officer. A person who is illegally misusing funds or property which belongs to another person: A lawyer was convicted of being a defalcator who made personal use of Richard's inheritance which he received from his father. Harmful statements regarding someone's good name, character, or reputation: During the Presidential elections, people hear many defamatory remarks being made by each candidate about the one who is running against him or her. © ALL rights are reserved. 1. An option that will automatically be selected by a computer if the user does not choose one: Some Canadian computers have a spelling default for North American spelling. Defaults are important for making computer systems behave in a predictable way without the user having to give lots of "obvious" details. 2. A lack of success in performing a task or in fulfilling an obligation: The default on the mortgage payments was a great concern to the bank. 3. Not showing up at a required court appearance: The plaintiff was found in default of the court by not coming to the trial on time. 4. In sports, non participation in competition or not appearing to complete a competition: The home team won the championship by default because the opposing team didn't show up for the last game. 5. Etymology: from early 13th century, "offense, crime, sin"; then in the late 13th century, "failure, failure to act"; from Old French defaute (12th century), "fault, defect, failure, culpability, lack, privation"; from Vulgar Latin defallita, "a deficiency or failure"; past participle of defallere, from Latin de-, "away" + fallere, "to deceive, to cheat; to put wrong, to lead astray, to cause to be mistaken; to escape notice of, be concealed from". 1. Not paying a debt or other financial obligation: Karl has defaulted on his loan. 2. Being unavailable in court although summoned to be there: Polly was fined by the court because she defaulted by not making an appearance as ordered by the judge. 3. Unable to appear for a game of sports or a contest when there was an agreement to do it: The flat tire on the bus caused the team to default on the game to which they were going. 4. With a computer, to use a device, a command, or a file when no other one is specified: Alisa's computer program defaults to a standard font whenever she uses it. 1. Debtors who do not meet their financial obligations: Charles Dickens' books are filled with stories of defaulters who went to debtor's prison. 2. Not responding to a court summons: The judge was not impressed by the defaulter because this was the second time the plaintiff had chosen to default on a court appearance. 3. A person or team that doesn't appear for a scheduled game or contest: The home team was severely criticized because they were the defaulters at the critical game. 1. To eliminate animal or protozoan pests or parasites from an infested area or host: Some countries are making efforts at defaunating single-cell organisms that divide within a host organism; such as, those protozoa that cause malaria. 2. To drive off or deplete animal life in an area: A process of defaunating local or global extinctions of large (vertebrate) animals as a result of human processes; such as by, hunting or the depletion of forests when people over populate such areas. Some areas have been defaunated by excessive deforestation by humans which threatens global biodiversity in some areas of the world. When some areas are overly defaunated, there are impacts resulting from the loss of key pollinators and seed dispersers by the absence of animals that indirectly affects the ecology of the forests. Showing page 12 out of 44 pages of 646 main-word entries or main-word-entry groups.